With five sessions taking place over the course of three days, the upcoming fall sale auction at Little John's Auction Service in Orange, Calif., is sure to have all of the antique and collectible firearms that a gun enthusiast could want. Beginning on Nov. 17 and running through Nov. 19, this firearms auction, which will be held concurrently on iCollector.com, will offer more than 450 items ranging from Colt army revolvers, to classic Winchester rifles, to English flintlock dueling pistols, and more. 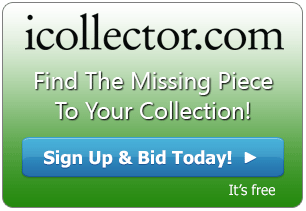 To get the full inventory, head over to iCollector, where you can survey all the lots that will be on the docket. 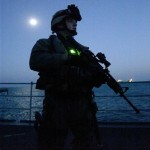 Many of the weapons up for bid are not only beautiful and rare, they also provide a deep connection with relatively ancient history. 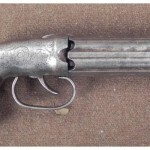 Other than the dueling pistols (lot #109), which come with a mahogany carrying case, there is a French Napoleonic cast bronze naval rail-gun (lot #112) available to gun collectors and history buffs who might want firsthand experience with the early 19th century wars of the same name. 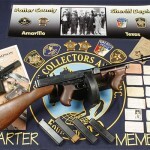 For those who are looking outside the firearms realm, there is also a Nuremberg-style suit of armor from around the turn of the 17th century (lot #129), a pair of handcuffs that were used to shackle John Dillinger when he was captured near Tucson, Ariz., in 1934 (lot #576), and a sterling silver pocket watch that once belonged to Sheriff Pat Garrett (lot #1456), the man who famously gunned down Billy the Kid. Many of the firearms that will be available beginning Nov. 17 transcend the ordinary, rising to the level of works of art. 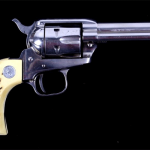 One of the numerous weapons that fits that description is a Colt single-action army revolver with a golden trigger, hammer and ejector rod, and a silver barrel, all of which feature fine hand-crafted engravings (lot #579). 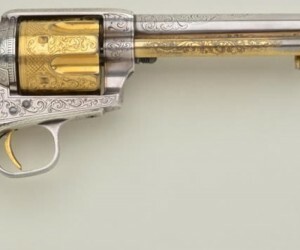 Another Colt pistol, this one an 1860 army revolver with gold inlay and custom engraving (lot #595), is a real eye-catcher, as is the engraved .22-caliber Stevens pistol with full gold plate and checkered pearl grips that was once owned by champion marksman Ira Paine (lot #1039). While guns will take up most of the headlines at Little John's fall sale, there are also dozens of antique swords and knives on the block, including a Philadelphia-style Eagle-headed officer's sword (lot #118) and an elaborate presentation sword designed by Tiffany's in 1872 (lot #1453). For those who can't make it to Orange, Calif., in mid-November, the only way to get a chance at this remarkable inventory is on iCollector.com.